Sisters of Mercy minister in thirteen of the thirty-two countries who made it to the World Cup, including the host of the World Cup: South Africa. The FIFA World Cup competition began in 1930, and that year Argentina was the runners up, being beaten by the first World Cup championship team from Uruguay. The ministry of the Sisters of Mercy in Argentina began in 1856 when four Sisters of Mercy arrived in Buenos Aires having journeyed from Dublin. Their leader was Mother Mary Evangelista Fitzpatrick. Twenty-four years later in 1880, the political situation in Argentina was very volatile and the Sisters of Mercy were not safe to remain there. The Jesuit college on the opposite side of the road from the Mercy property had already been burned down. The twenty four Sisters of Mercy, still led by Mother Mary Evangelista Fitzpatrick, decided that they should move, and that they wanted to stay together. The bishop in Adelaide, Australia, invited them to come to that diocese, and they accepted his invitation. Ten years later in 1890, six Sisters of Mercy returned to Buenos Aires, Argentina, and refounded the ministry there. Today, there are sixteen Sisters of Mercy and twenty associates who live and minister in Argentina. All are part of the Institute of the Sisters of Mercy of the Americas, CCASA Community (Caribbean, Central America, and South America Community). They are involved in educational, housing, health care, and pastoral and spiritual ministries. 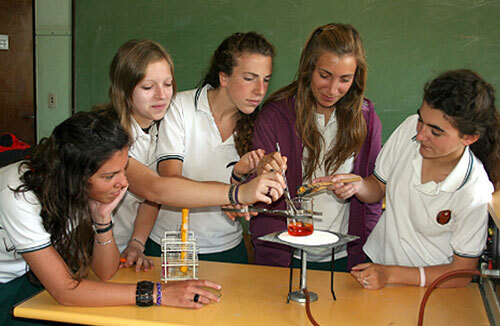 The Sisters of Mercy sponsor Colegio Santa Ethnea in Buenos Aires, where Mercy education is provided to primary and secondary students. This school was founded in 1932, and has distinctive programmes in the areas of non-violent conflict resolution and protection of and appreciation for Earth. More information can be found at: http://www.colegiosantaethnea.com.ar/. In addition to Colegio Santa Ethnea, Sisters of Mercy and associates further the educational ministry with several literacy and alternative education programmes that give particular attention to women and children suffering from the effects of poverty. One programme particularly focuses on ministry with street children. One Sister of Mercy is a psychotherapist, and several accompany people on their spiritual journeys. A couple Sisters of Mercy minister within a parish context, providing bible study groups, prayer groups, and other pastoral accompaniment. Some of the health-related ministries include a sister who is a practitioner of alternative medicine and another who is a physiotherapist. A couple of sisters are engaged in prayer ministry on a full-time basis. Some of the ministries that focus on the empowerment of women are a sewing workshop that assists women who are economically poor earn an income and Casita de Colores in Moreno. Casita de Colores works with women and their children who have been victims of abuse; it provides housing and support services to between 10 to 12 women and their children.